We're not called the scenic city for nothing. It's a varied landscape in every direction. We are the only city to be twice named Best Outdoor City, in 2011 and 2015! To find out more about the diverse outdoor adventures that the Chattanooga area offers, check out Roots Rated. And there is no special season here, all four seasons are filled with plenty to do. We've got water sports, mountains, hiking, music, art, theater, Civil War history, a nationally-renowned riverfront with ongoing events, and a vibrant entrepreneurial spirit powering all that happens. 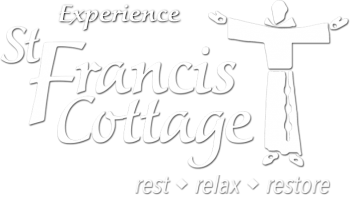 This busy and energized city has just about anything you might want to see or experience and a place to rest, relax, and restore at the end of the day, St Francis Cottage. Let us be your hosts while in the Scenic City. Whether you're here on vacation, business, or just passing through, unwind and be refreshed in one of our seven comfortably appointed bedrooms and then start your day with a sumptuous breakfast just right for whatever you've got planned. The wooded lot and the peaceful surroundings will almost make you forget you have quick and easy access to all parts of town, the interstates, shopping, theaters, and a multitude of restaurants. Come stay with us. See a calendar of all our yearly events! View out large list of places to eat!